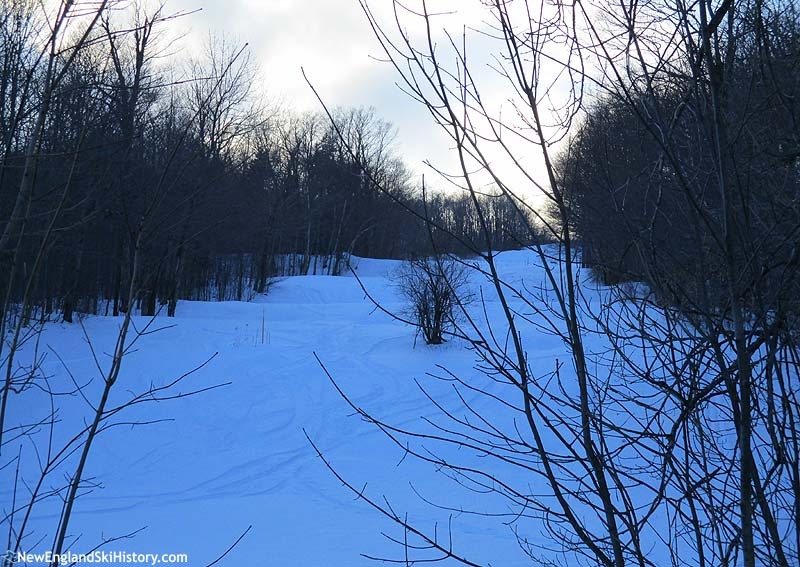 While overshadowed by Magic Mountain on the north side, the east side of Glebe Mountain has had an on-again, off-again ski area for nearly half a century. Surrounded by ski houses, the area generally only operated on weekends and holidays throughout its history. Glebem Mountain Farm ski area was developed by original Magic Mountain co-developer William Ingraham. 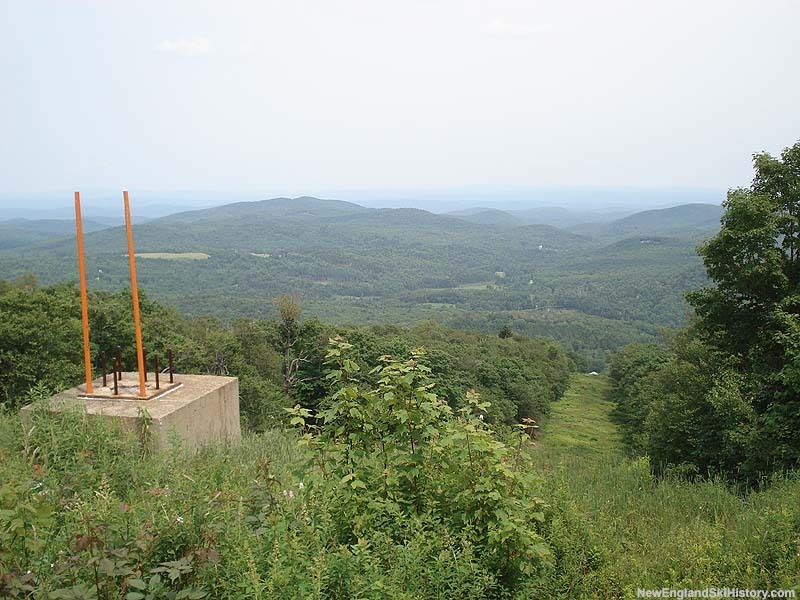 In 1963-64, a small Borvig T-Bar was installed near the base of the mountain, serving short trails of all abilities. Eventually renamed "Timber Ridge," the ski area's vertical drop more than doubled in 1972 when the Upper Mountain was opened via a new Hall double chairlift. Plans were announced to eventually make the area a private family country club. Adhering to the family image, manager Jeff Pitchford remarked that, "[w]e don't have a bar in the base lodge and we don't want one." Entering the 1980s, two new complexes were proposed. The first, Southbrook, was cut but never saw the installation of the planned lift. The other, the North Glacier Bowl, was never cut. Instead, in part due to multiple seasons of bad snowfall, Timber Ridge likely found itself defunct by the middle of the decade. In 1986, the new ownership group of Magic Mountain, led by Simon Oren, purchased Timber Ridge. In 1987, the two areas were connected via a pair of long trails, making one large resort called The Magic Mountains. The winter of 1988-89 was so lean that the connecting trails between Magic and Timberside were seldom, if at all, open. In 1990, Oren sold his remaining interest in the company to partners Joe O'Donnell and Petros A. "Bob" Palandjian. Following the 1990-91 season, the decision was made to shut down both Magic and Timber Ridge. In the spring of 1993, the owners decided to put Magic and Timber Ridge on the auction block. The Timber Ridge chairlift was sold to Smugglers Notch and installed in the Morse Mountain area in later that year. While Magic Mountain reopened in 1997, Timber Ridge remained dormant. In recent years, there has been a slow, but gradual effort underway to reopen Timber Ridge as a small, standalone area. While no lifts have been installed, many of the trails have been kept clear. In addition, the area has sported a modern grooming snowcat for nearly a decade. In January 2014, Timber Ridge was featured on the National Geographic show Building Wild's episode "Top of the World," in which a cabin was constructed on the top footing of the former Showcase double chairlift. It is not known if or when lift service will return to Timber Ridge, or if it will ever reopen to the public. 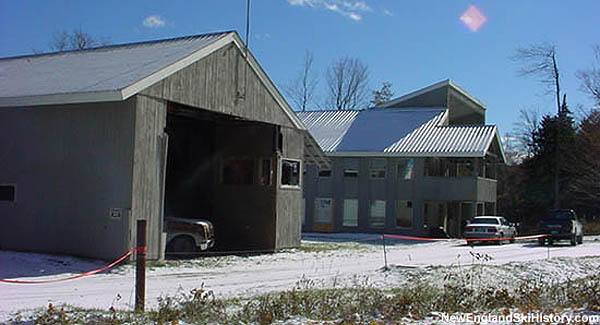 "We had a house at the base of timber ridge on rt 11 before the entrance of the ski area. spent many years skiing Magic mountain as a weekend ski instruster"
"I skied the Timberside only once, sometime in the 80`s. I remember a long and flat connecting trail from the Magic side. The skiing at Timberside was quirky, ungroomed and absolutely fascinating, full of sharp turns, whalebacks, boulders you had to ski around, etc. It was the antithesis of the homogenized skiing offered at many of the big resorts today.So sad to not have skiing like this anymore. A wonderful memory..."
"I learned to ski as a young child at Timber Ridge. We were there every other weekend. Cruising down Devil’s Hopyard, I-91 and Dad loved a very long green from the top i believe called green /dream weaver ? I recall the always-welcoming Goodeve family, the O’Donnells and the elusive visits by Grant Goodeve and friends from Hollywood. In those days it seemed like all the skiing you could ever want, and a close-knit family atmosphere. So grateful to mom and dad for that experience "
"The Bisbee family had a house at Timber Ridge and we were Founder Members. That meant our family could ski FREE for life at Timber Ridge. It was an every weekend family and friends gathering. Everyone knew everyone. The deal was if a someone waited in a lift line for more than 5 minutes you got your money back! Including Paul Newman. So many great, great memories. What a wonderful experience to be a kid in this ski envirnoment. I remember sledding at night on cafeteria trays from the base lodge. Now in my mid 50s, I ski as much as I can (3-4 trips/year) out west (CO, Ut & WY) and love it still. I learned to ski in VT. I thank my late father for giving me the gift of skiing. " "Came across this piece. I grew up in Chester, and spent my childhood skiing at Timber Ridge every weekend with my family, friends like the Waits, Trasks (Beaver, RIP), Goodeves, Arnolds and countless others. My moms side of the family are Ingrahams...I remember meeting Adam Rich, Paul New,and and Robert Redford! Very fond memories and as I re live my childhood watching and skiing with my 2 little girls it brings back sooooo many incredible memories......it was a VERY special place......"
"To me, Glebe Mountain and Timber Ridge still live. The lights in my parents' house still burn brightly as a third generation enjoys this truly family area. There may be no lifts, but Tim Waker, the current owner, mows and maintains the remaining trails as well, if not better, than many operating areas. I know some off piste skiers who ski there very year. It is among their favorite places. My last run was only a few years ago, on the Lower Renegade to the Base Lodge. A little rough, but in some way it was the best run ever. " "My parents were among the 'Founder Members' who renamed the mountain Timber Ridge in the 70's. Timber Ridge was an amazing place. Our family would jump in the car every friday night and cruise up from CT to VT. I spent all of my teen years there skiing with my parents, two brothers and sister (who often skied with Paul Newman's daughter)....pretty cool! I now live in Waterville Valley NH where I have raised my children to love skiing as much as I do. Thanks to John and Judy Troy (my parents) for giving me such a great childhood at Timber Ridge." "The Windham Elementary school had ski days when it was Glebe Mt, and I learned to ski. When it became Timber Ridge my mom worked in the cafeteria there for many years getting me free skiing. I worked there as a teen and skied whenever time allowed. I have so many memories of skiing, helping the ski patrol, working Christmas parties. I met Paul Newman there! I still have my Timber Ridge Ski patch. Yup, the good old days." "On the National Geographic episode, they made it sound like 1 guy owns it with his son, and they have no plans of ever opening it. They built the cabin and plan to use it with family and friends and small rail jam events." "When this episode opened up and they showed the view and did the intro, it was wow! I've beeen there! I skied there when in high school, mid-sixties! Yea, it was GLebe Mt. It was great fun, no crowds and long lines. Great to see it again, especially from that great little cabin. Good job!"